The Nippon Art series is Namiki’s entry level line of maki-e pens. The pens are screened and on my Flower Basket version I do not believe any of the artwork to be done by hand. It’s “Hira” or flat maki-e and it really is flat to look at. I also see no gold sprinkles which makes me question if it should actually be considered “maki-e”, which I am told translates roughly to “sprinkle picture”. 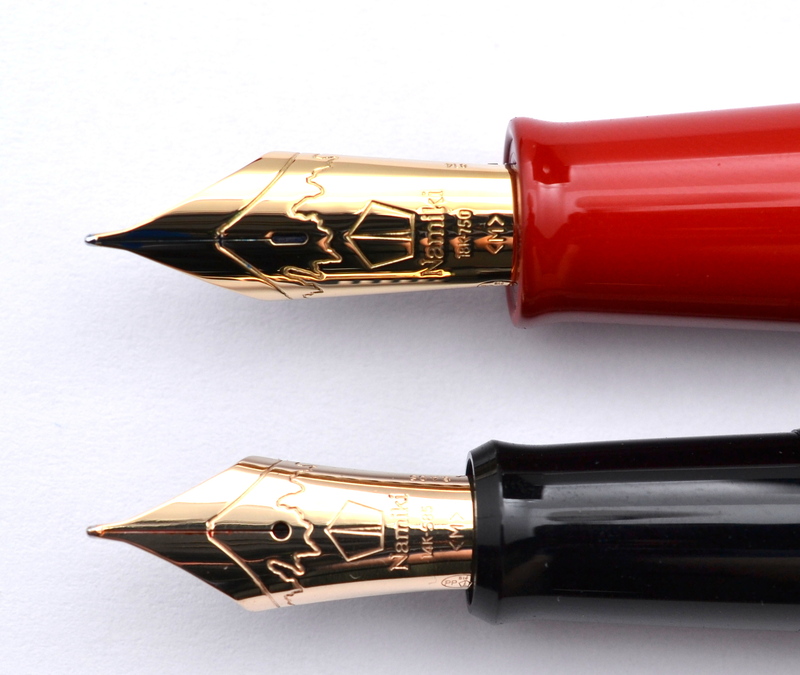 The body of the pen is plastic covered in urushi lacquer and has a gold plated clip and thin cap band. The pen is very simple and elegant; it looks great despite the dull hira maki-e. The section has a seam on it and I do not believe it to be painted with urushi. The pen is signed “Kokkokai” which is not a specific artist but rather a group of artists. The pen is very well balanced and feels great in hand. It weighs about 32 grams with converter and measures 5.6” long capped. 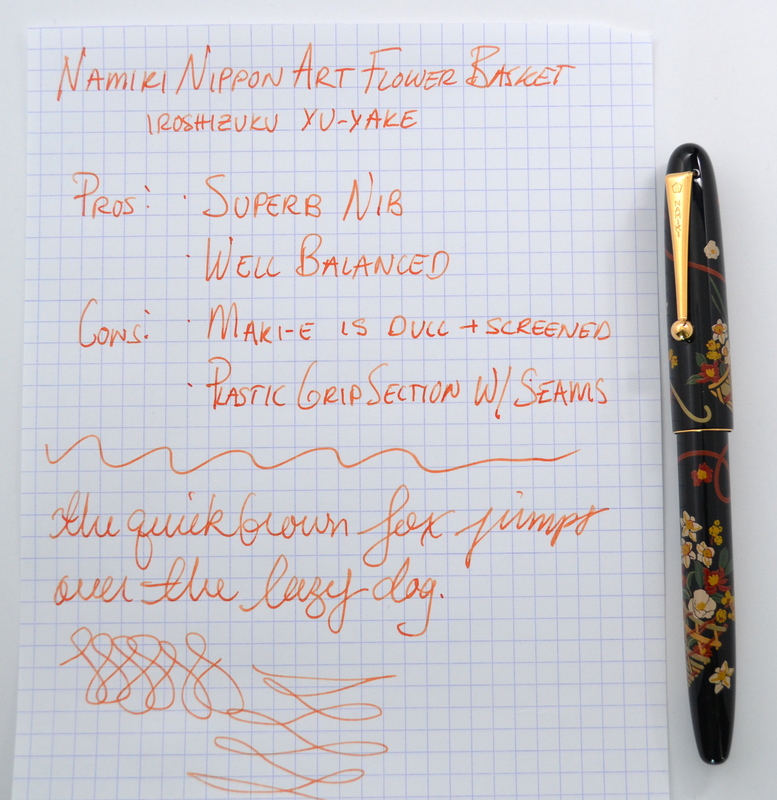 This is a full-sized and very comfortable pen despite being the smallest in Namiki’s lineup. The inside of the cap has a soft fuzzy material near the lip. This is done so that when posted the cap does not scratch the lacquer body (a very nice touch). 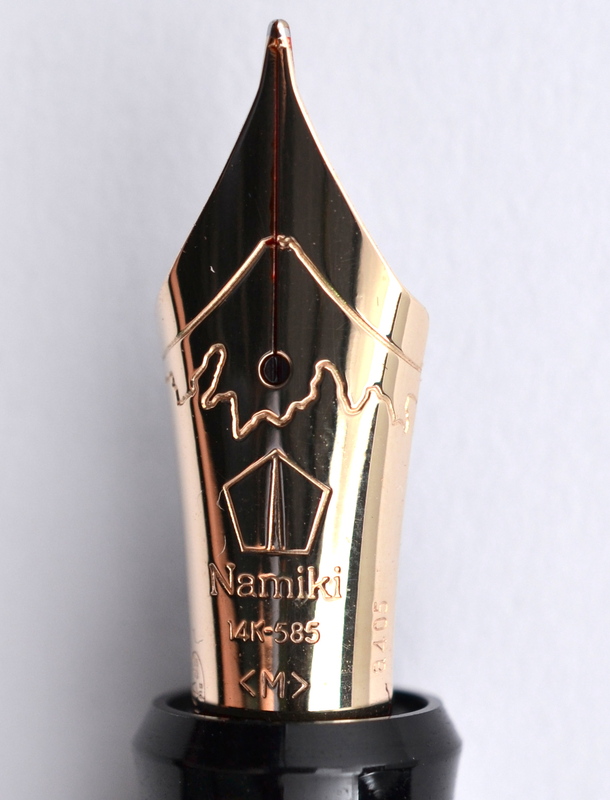 Like the Pilot Custom 743 , the Nippon Art’s gold nib is lighter in color than the gold trim. The pen has a #10 size nib and despite the different decoration, I believe this nib to be the same as a standard Pilot #10 (I am going off of a appearances only, so please correct me if I am wrong). 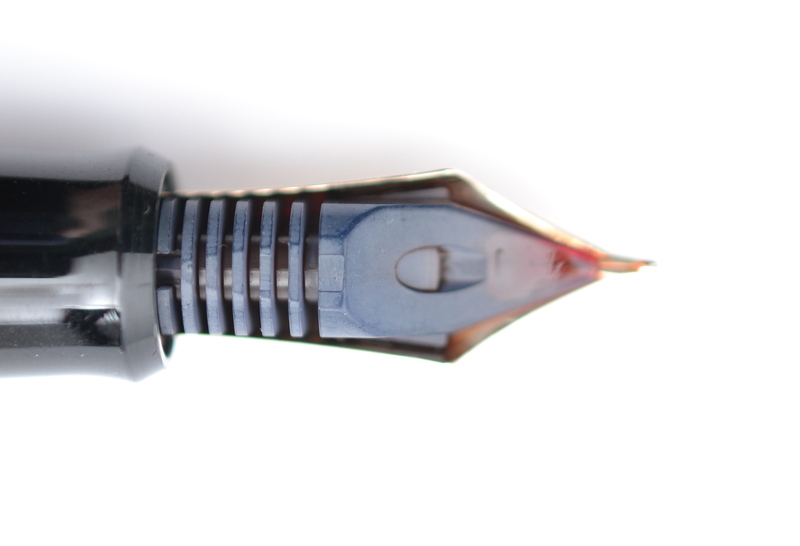 The Namiki #20 nib is the same size as the Pilot #15 but has a different shape and breather hole. You can see the date stamp “a405” on the side of the nib. The “a” refers to the welding machine used at the Hiratsuka and “405” refers to April 2005. 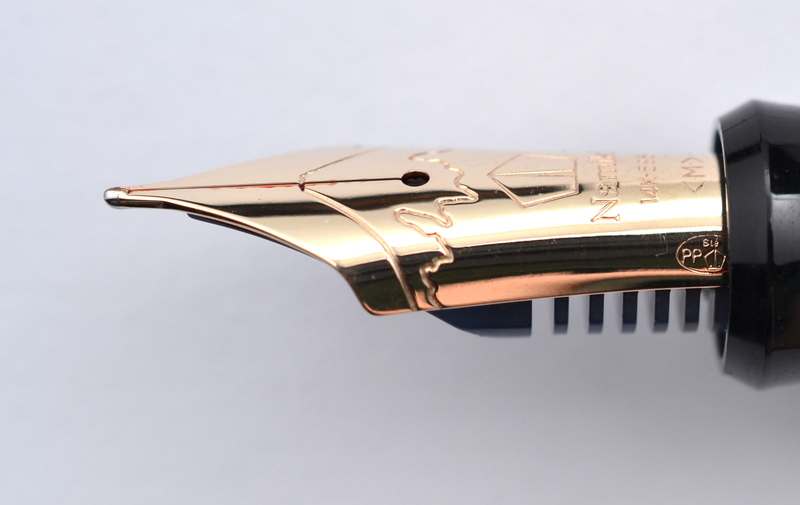 The 14kt gold medium nib is ultra smooth and soft. It’s a wet nib and I find that it is a bit wider than your average Japanese medium. The Nippon Art comes with the Pilot Con-70 vacuum fill converter. The Con-70 holds 1.1ml of ink (more than twice as much as an average converter). After using a good number of these Con-70s I have found that some work better than others. I always fill them with a syringe for this reason. I also find them more difficult to clean but the huge capacity outweighs any of these of these drawbacks. This is my favorite Pilot/Namiki fountain pen I have used so far…the elegant design, balance, and wonderful nib have won me over. The retail price for these pens is a staggering $750! That is quite a lot of money for this pen. I paid around $200 for mine second hand. In my opinion these pens are a good buy at around $200-$350. Some designs are more attractive than others and some have more handiwork.